NextAid and Solar Sister present ILLUMINATE, A Benefit for Economic Empowerment for Girls and Women in Africa on September 18, 2011 from 5pm – 1am at YOTEL New York City. NextAid and Solar Sister are two innovative organizations focusing on elevating opportunity for girls and women in East Africa. 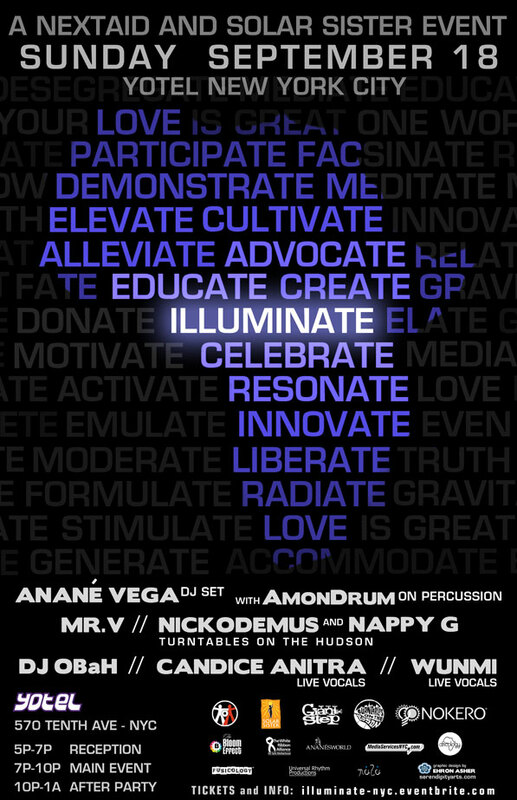 They’ve come together to present ILLUMINATE, an energetic dance party and fundraiser that will bring together renowned New York DJs, musicians, and poets including Anane’ Vega with AmonDrum on percussion, Nickodemus with Nappy G of Turntables on the Hudson, DJ OBaH, and Mr. V with live performances by Candice Anitra and Wunmi. The event will serve as a kick-off for one of the most important weeks in global action; organizations convene in New York City to devise and implement innovative solutions to the world’s most pressing problems. Some of the conferences and summits happening that include Clinton Foundation’s Global Initiative, the United Nations General Assembly, White Ribbon Alliance’s Women Inspiration and Enterprise Symposium and Mashable’s Social Good Summit, and much more. NextAid and Solar Sister’s Illuminate gives the leaders of today and the change-makers of tomorrow a chance to listen to great entertainment, check out the latest in new technology innovations, mix and mingle, socialize and, of course, dance! WUNMI (Live Vocal performance) just added! Group packages, VIP cabins, and sponsorships are also available, contact carolann[at]nextaid.org to inquire. In addition to enjoying an incredible line-up of performances, guests will also have the opportunity to browse the latest in innovative technology solutions in a Tech4Development Marketplace that will feature products that have the breakthrough potential to improve the lives of the poor through creative, appropriate design, such as the world’s first solar light bulb developed by Nokero, and other products from Maternova, Renewit, Konarka, WECARE Solar and Wello Water. With a mission to improve the lives of children, youth, and women in Africa by promoting and implementing sustainable solutions, NextAid raises awareness for, and partners with, community-based projects and grassroots organizations in Africa. NextAid implements and promotes integrated approaches with the belief that it is the best formula for establishing real and lasting change. Through music events and public education initiatives, NextAid provides empowering opportunities for concerned individuals to make a difference. Solar Sister eradicates energy poverty by empowering women with economic opportunity. We combine the breakthrough potential of solar technology with an Avon style direct sales network to bring light, hope and opportunity to even the most remote communities in Africa. Created by YO! Founder Simon Woodroffe OBE and YOTEL CEO Gerard Greene, Yotel offers a ‘first class’ hotel experience translating the language of luxury airline travel and Japanese influence into small but luxurious cabins. Yotel’s New York location is home to four multipurpose event spaces (The Terrace, Club Rooms, The Dohyo, and the Studiyo) providing guest with social ease during the day and at night morphing into a beer and cocktail fueled lounge with DJs supplying endless beats and ambiance.